Circle / 10-meter circle: Circle, or green is the area that is within 10 meters of a target of any given hole. BUE - Bullseye hit: All drives on landing (on par 3 holes, par 4 holes two throws) to the 3m circle. GRH - Green Hit: A Green Hit occurs and is marked if a player's disc is 10 meters from the target in two throws under par or less. E.g.  a green hit is scored on a par 4 hole by reaching the 10 meter circle in 1 or 2 throws. Note that Bullseye hit is always also a Green hit. And the throws must be safe (no OB). OCP - Outside the Circle Putt: If a player's last throw on a hole is made from over 10 meters away from the target. ICP - Inside the Circle Putt: The number of throws taken by a player within 10 meters of the target, but not inside the Bullseye. So, this is number of putts between 3-10 meters from the basket. Exept if one misses a putt inside 3 meter ring, then it's counted as ICP. IBP - Inside the Bullseyt Putt made: The throw taken by a player within 3 meters of the target. Usually marking that the last putt was a tap-in. This putt is not counted into ICP. OCP avg - Outside the Circle Putt Average: The average number of Outside the Circle putts a player has made per round. ICP% - Inside the Circle percent (In player profile): The percent of successful throws made within 10 meters of the target. ICP would not calculate putts inside 3-meter circle (bullseye). GRH% - Green Hits percent (In player profile): The percent of holes a player has successfully reached the 10-meter circle in two throws under par. BUE% - Bullseye Hits percent (In player profile): The percent of holes a player has successfully reached the 3-meter circle in two throws under par.